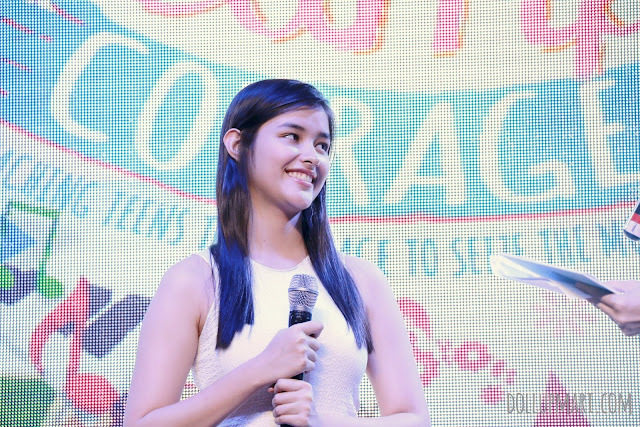 As one of the most popular teen stars of today, it's no wonder why so many people look up to Liza Soberano. But even she has her own story to tell. 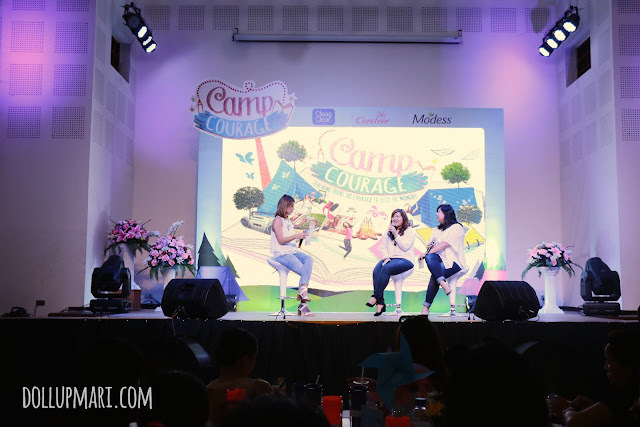 She may be in all the blockbuster movies, all the top-rating TV shows and featured on all the noteworthy magazines of today, but she, too, also feels uncomfortable about herself and growing up at times. She's just a more popular example, but she's not alone. A study conducted by a firm for Johnson and Johnson found that 75% of 13-17 year old girls want to feel accepted but are afraid of being judged. 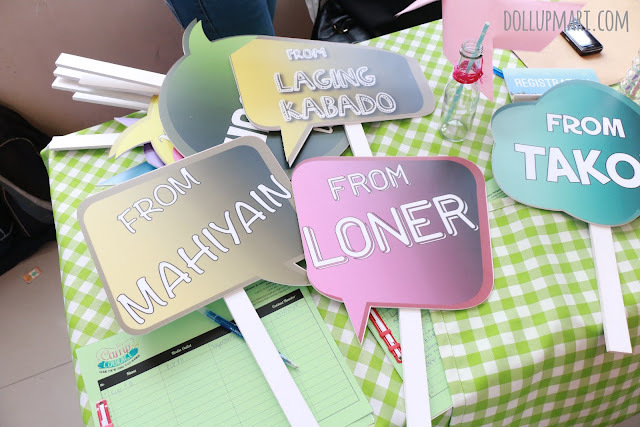 Afraid of being judged, they feel dyahe (awkward), hiya (shyness), and kaba (uneasyness). 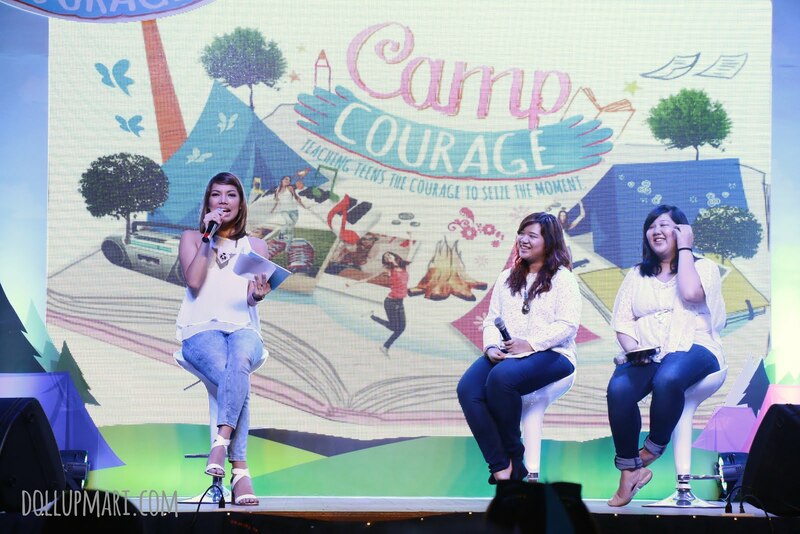 Knowing this, this is the reason why Johnson and Johnson brings you Camp Courage! Camp Courage is a movement that aims to help young Pinays nationwide to get past their insecurities and fears and become the confident young women they should be. 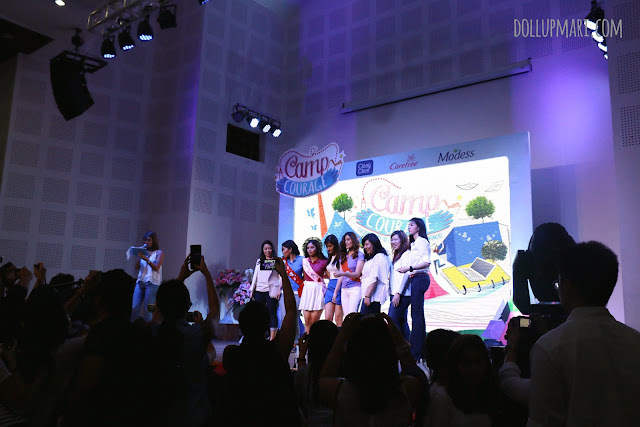 Johnson and Johnson believes that a girl's teen years should be the most fun and happily memorable years of her life, and they want to empower Pinay teens to realize their full potential and make a move. Last Wednesday, I was invited to the formal press launch of the movement. 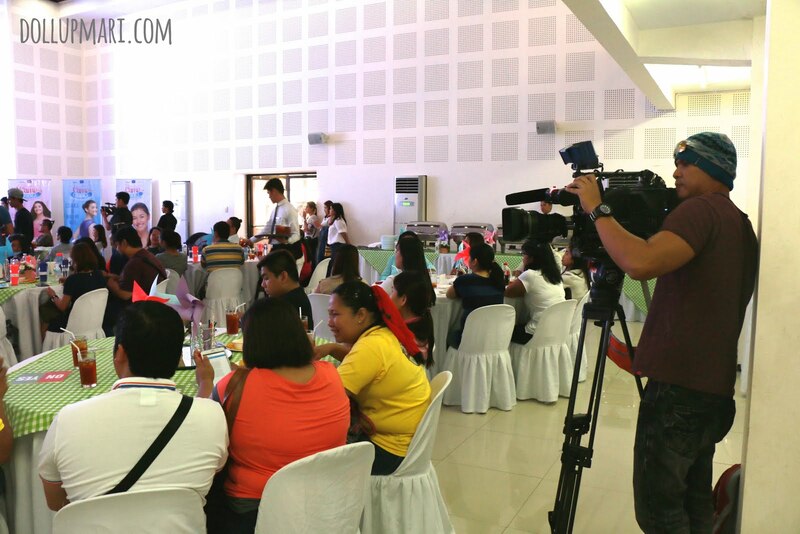 This was held at Cayetano High School in Taguig. This area amused me altogether because it felt like a whole new world. 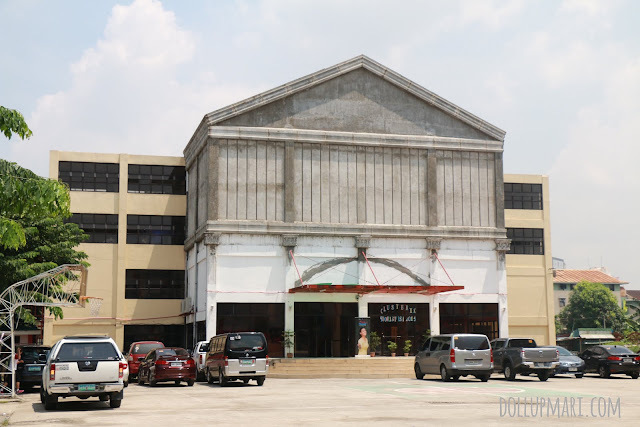 I'm a North person so anything beyond Greenhills is considered far. 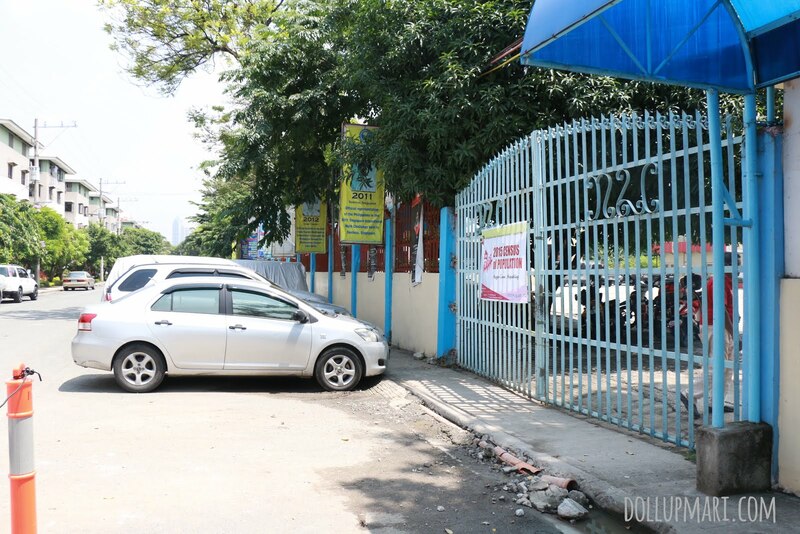 Since this school is borderline Parañaque, it felt like a new kind of world hahahaha. This is the building where they held the event. This is a real school on a normal school day. 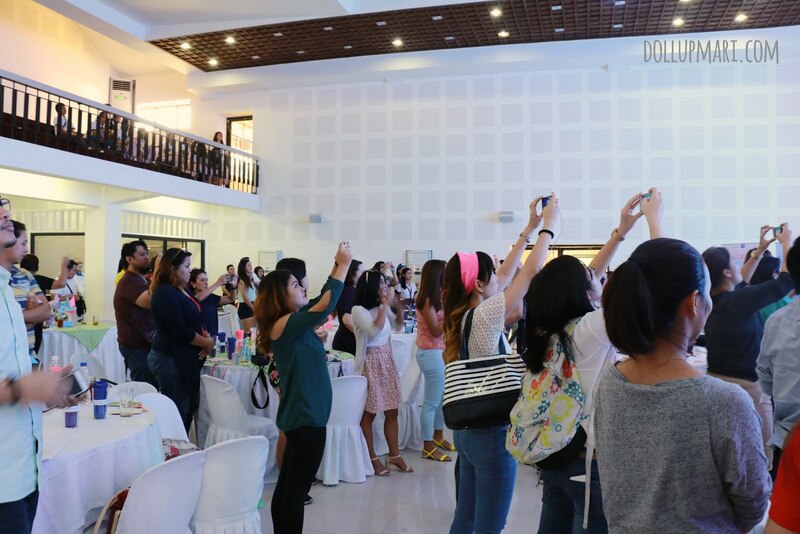 I heard that they went ballistic when word got out that Liza Soberano was visiting. When I get here, I am greeted by the photobooth area. They have all sorts of pop up props, with negative traits (ex. 'from loner') and positive traits (ex. 'to ready to face the world') because they want guests to identify what holds them back and let them identify where they'd like to see themselves in. For me, I personally chose laging kabado because I'm a very paranoid person. I always worry about everything, even the smallest things. And I chose 'to ready to face the world' because I know life would be so different if I weren't this paranoid about things. 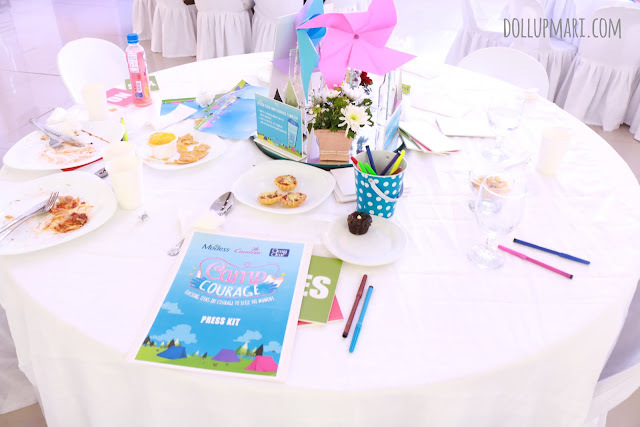 The time I go inside the event hall, I'm greeted by this whimsical table set up. And all the guests were given courage tumblers! It's basically a customizable tumbler, and they gave out sheets of special paper alongside markers so everyone could play around with their ideas. The nice stage set up. 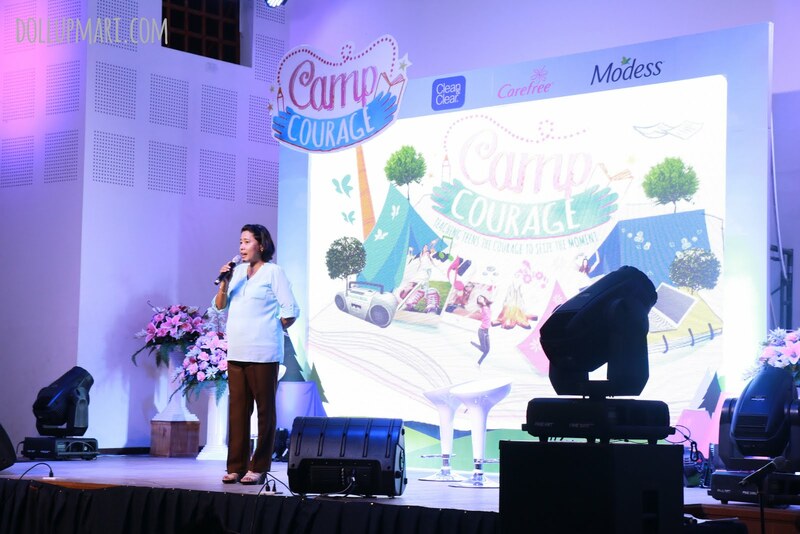 To kickstart the event, the school's principal gave welcoming remarks and a talk of gratitude towards Johnson and Johnson because as an educator, she encounters what her pupils go through in their teen years and believes that Camp Courage is truly something that they will benefit from. The emcee now welcomes the speakers for the campaign. 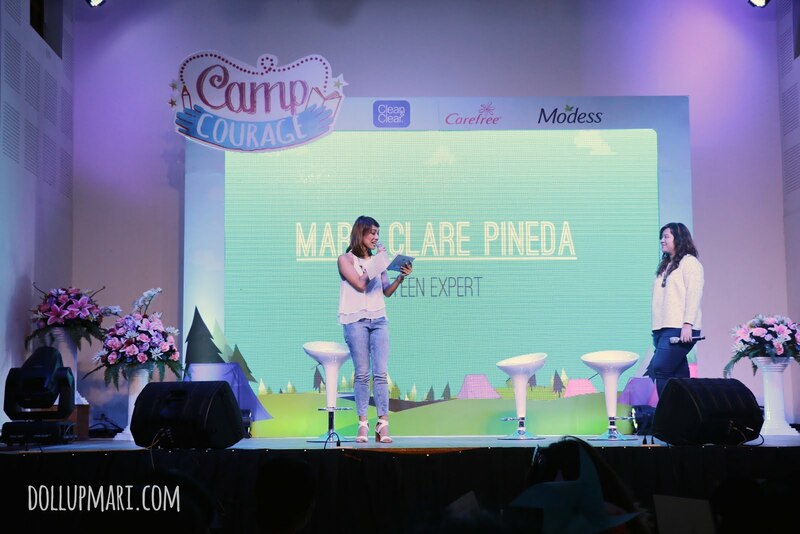 The first is Marie Clare Pineda, a personal development coach, pre-school coordinator at Uno High School, and a Masters in Development Psychology student at the Ateneo. The second speaker who joined onstage is Isabel Flores Garcia. She is the managing director and founder of the Better Story Project, a non-profit movement that aims to mentor young girls. 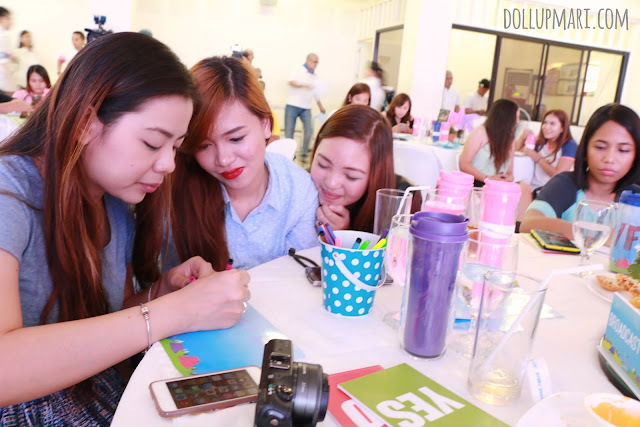 My tablemates were also good sports and were also answering the questions that they were asked. I forgot what question they were saying yes to, though, hahahaha. The speakers spend a good time talking to the audience about their own struggles, about their own experiences, and of course they talk about how excited they are to be part of this big project. 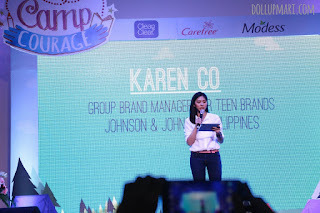 After the speakers share their own experiences, Karen Co, the group brand manager for teen brands of Johnson and Johnson, goes onstage to talk about her feelings about the project. According to her: "Knowing and understanding the needs of young Filipinas is the very foundation of the advocacy we are doing at J&J Philippines. That is why we developed Camp Courage-- an advocacy that helps today's girls fight hiya, dyahe, and kaba, and turn them into saying 'kayang-kaya'!" As such, Johnson and Johnson will be aiming to reach out to 400,000 Pinay teens nationwide spanning at least 500 schools. 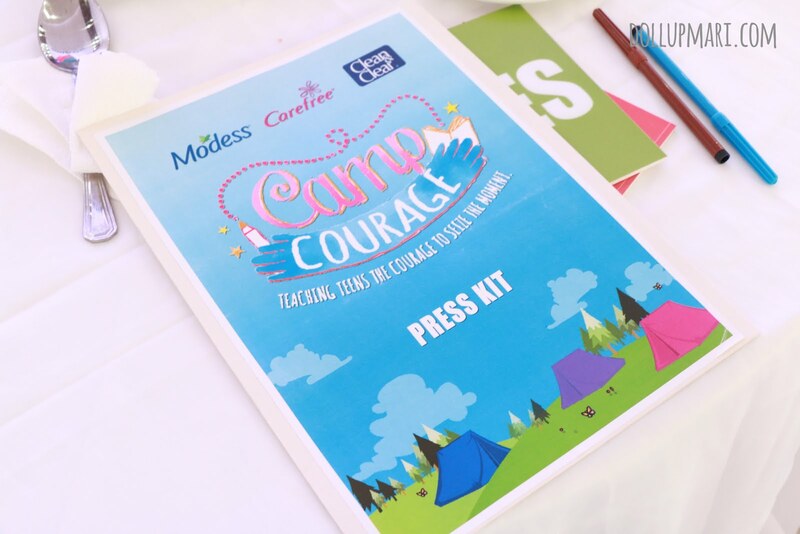 Camp Courage will conduct workshops and activities for girls to unleash their confidence and help them understand their bodies and their teen years better. My very sport tablemates posing for me while Phylicia does her tumbler. 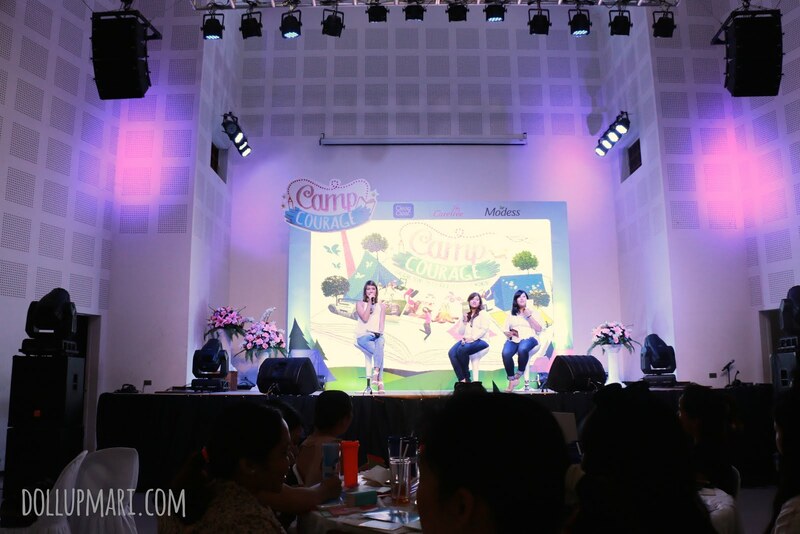 Yes I like how they are even doing kilig poses while watching her do the tumbler hahaha. 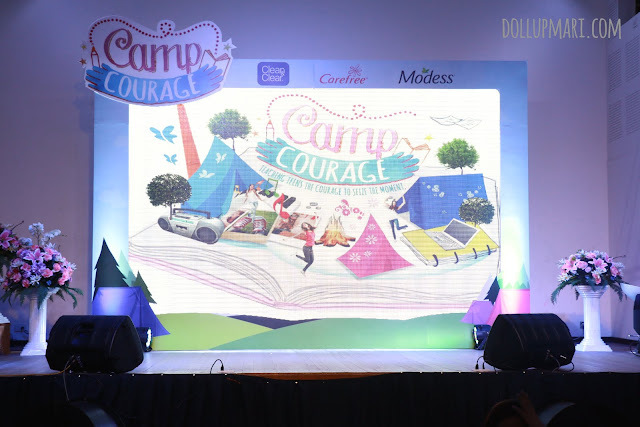 But well, that's only one half the event because the main highlight is the big reveal of their senior scout, Liza Soberano! 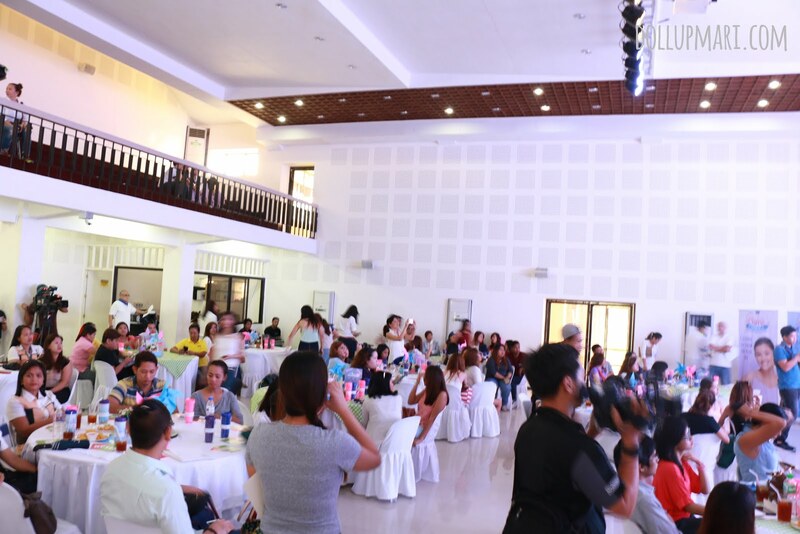 I was shocked because I didn't expect any celebrities would be coming. 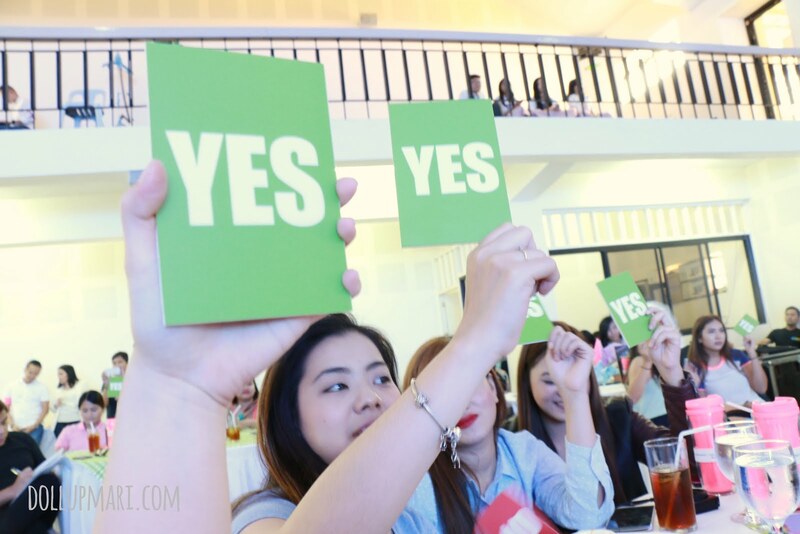 I have seen teen talk campaigns like these but they usually get scientists and bloggers and journalists to be the speakers and they usually are also the endorsers of the campaign. 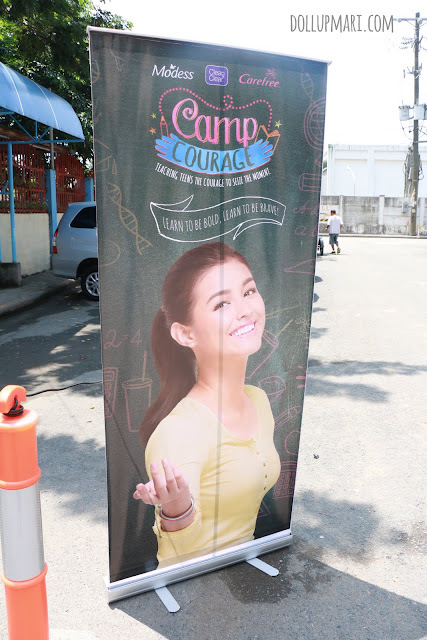 When I got to the entrance and saw Liza's tarps displayed around the area, it kinda dawned on me that she might be coming. And yeap, when I asked Cathy, yes she was coming. 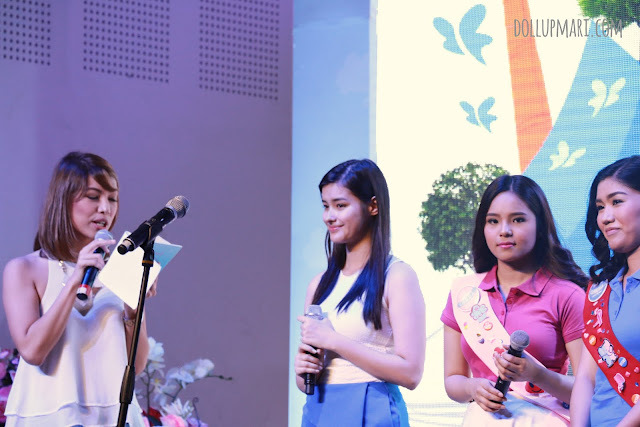 I can't believe I saw Liza Soberano right before me. And I can't believe that she is more immaculately beautiful in person than what we already see of her on TV. And all of us bloggers were even more shocked to notice that she didn't have any makeup at all. Her hair was even wet; it's like she took a shower and ran out of her house and just stood onstage like a goddess for everyone to admire. 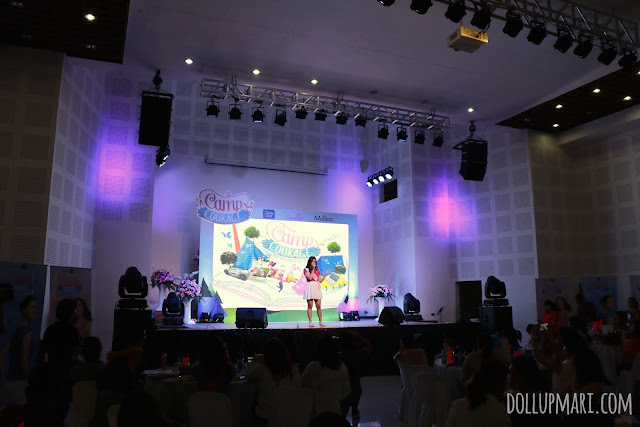 She shared her own experiences as a teen, and shared that while she may be admired by a lot for being a celebrity, even she, too, has insecurities. She admits that she always gets stage fright when talking to a lot of people. 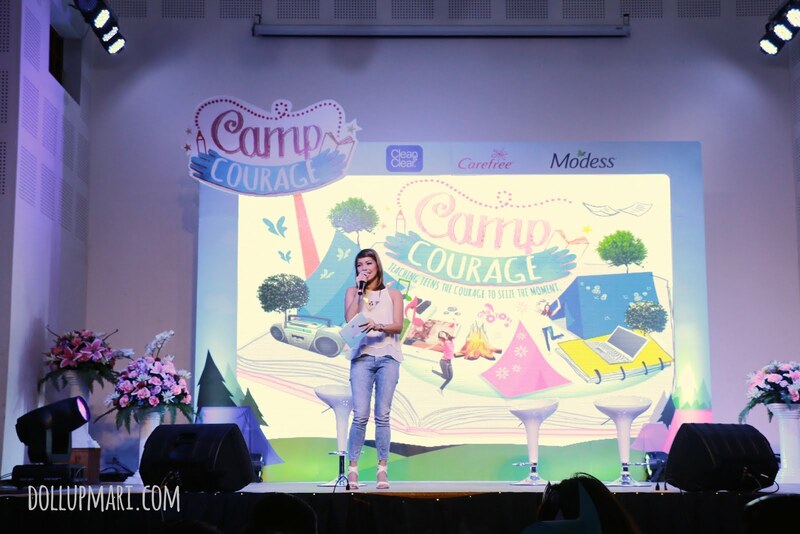 She also shared that she's learned that the teenage years should be the most exciting phase in a girl's life, and how she's one with Camp Courage in making girls more confident to seize every moment and not let opportunities pass them by. 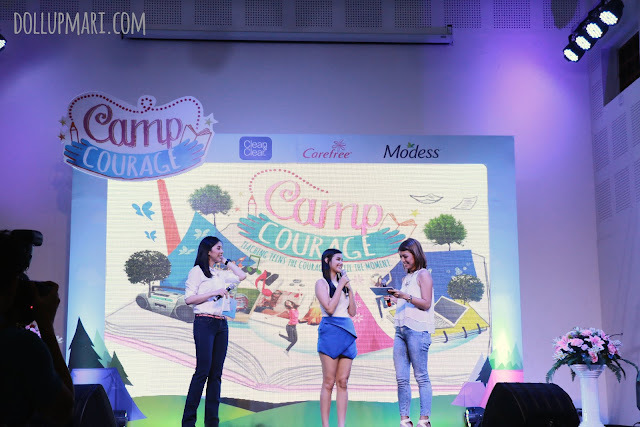 Liza and the other camp scouts are all invited onstage and have a little girl talk. As usual, this is what you would expect to see in the audience if Liza Soberano is around. Yes I kid you not the crowd was not like this before she arrived. And I am also guessing that I must be in someone else's publication or blog holding my camera and awkwardly standing while taking her photos. Liza poses with Johnson and Johnson executives before heeding to interviews from the members of the press. 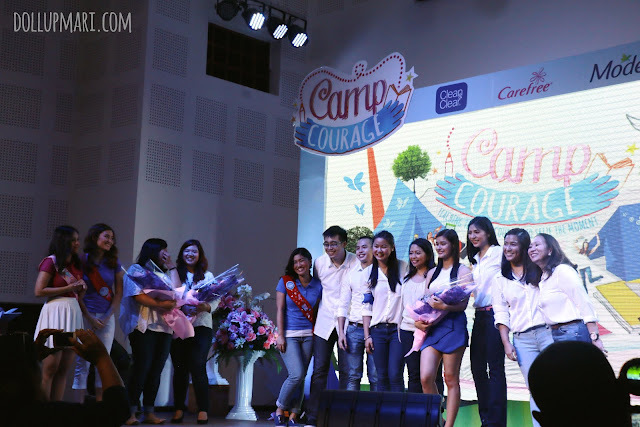 And the whole team behind Camp Courage, as well as the speakers and scouts, have their photos taken with Liza. 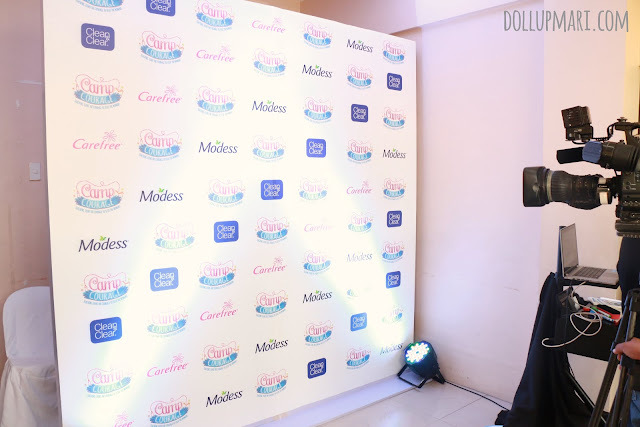 Yes this is the perfect photo to describe how hard it was to get a good photo of Liza hahahahahahaahahahahahahahahhaha (yes it was a struggle I thank my high high heels for giving me a much needed height boost that day so I could take good photos of her). Join the conversation using #CampCouragePH, and watch out for their site launch this September!